The Advocate for the Seeking Common Ground Circle is Rev. Dr Amelia Koh-Butler. We asked Amelia to share a bit about herself. My greatest achievement has been keeping my integrity in ministry. My Nana always taught me don’t trust the church as an institution, do make a difference from within, rather than casting stones from without. The future of the Uniting Church is to live into the vision of Being a Multicultural Church who sees the imago dei in others, whatever the faith background. It is tied to investing in intercultural fresh expressions and challenging the dominant culture of white, middle class, ageist attitudes in too many of our Presbyteries. A call to heaven where denominationalism falls away. Reclaiming our prophetic voice and action, Wesleyan-style, about injustice and prejudice and contributing that voice and action into the world. I was born into a mixed culture family. Buddhism, Taoism and Confucianism confronted atheism in my early years and I was only ‘christened’ in order to go to a church school where I was evangelised. As a Christian I learnt the cost of faith when I was disowned by family. I was initially enthralled by evangelical faith, but living overseas exposed me to ecumenism and the stretching of my faith by others. It also taught me practical apologetics. I am currently in a peer supervision group in a CPE with a Buddhist Monk, a Catholic Priest, a Catholic nun, a Fijian Methodist and a Pagan Witch (at least a couple of whom are not heterosexual). They keep me honest in my articulation of faith. They encourage me in my followership of Jesus Christ – even more than the UCA does… we need to work on that! Amelia is both an accredited Youth Worker and Minister of the Word currently working for Parramatta Mission in the Synod of NSW/ACT, where she is an Interfaith Chaplain at Western Sydney University. Amelia has served the Church nationally in many roles including as a member of Assembly Standing Committee, the Multi/Cross Cultural Reference Committee, Education for Ministry Working Group, and Worship Working Group. Amelia is currently the Worship and Liturgy Chairperson for the World Methodist Council with a primary focus on multicultural and intercultural expressions of worship. 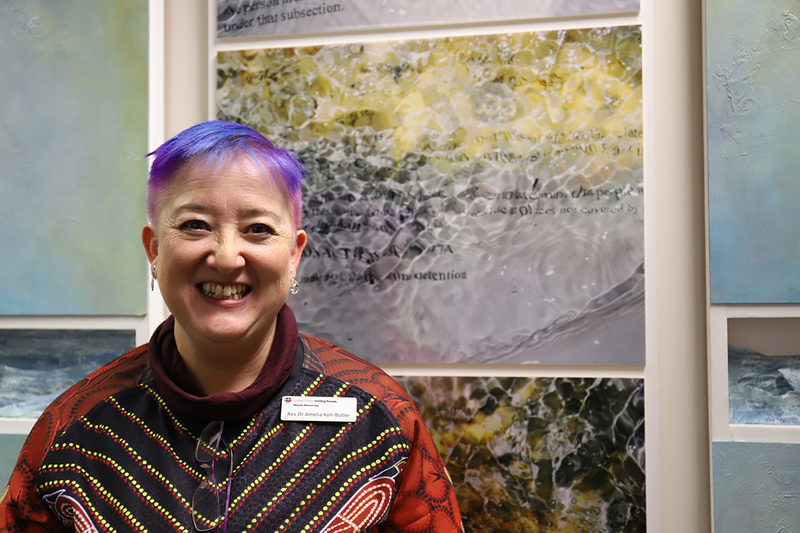 She is currently a member of the Western Sydney Indigenous Advisory Group and participates in Interfaith events, such as the Affinity Intercultural Foundation's annual Abraham conference. Amelia has also served in a variety of Congregational, educational and community placements.